An American observer in the Crimean War, Captain (later General) George McClellan described the French Zouaves as the '...most reckless, self-reliant, and complete infantry that Europe can produce. With his graceful dress, soldierly bearing, and vigilant attitude, the zouave at an outpost is the beau ideal of a soldier'. With their dashing but brutal exploits their fame quickly spread, and they were much imitated in many armies, particularly those of the American Civil War a few years later. Although this set has a good number of firing and marching poses, there is a high proportion of figures apparently engaged in hand-to-hand fighting, which mirrors their image perfectly. Much use is being made of the rifle as a club, while others are showing the fearsome bayonet. A quarter of the poses in this set were previously released in the Strelets set of French Light Infantry, and a few do not seem particularly natural (we didn't care for the officer poses), but in general they are a lively and exciting bunch. The exotic costume of short jacket and very baggy trousers has been well realised, and it is good to see a variety of headwear including not only the fez but caps of various kinds. However many of the men have a turban wrapped around the fez, which was only worn in full dress. The men have the wide body belt and more narrow leather belt on which the cartridge box rests, but we were surprised to see so many of the men wearing their full pack - fine for those on the march but perhaps less likely in a siege situation like Sevastopol. 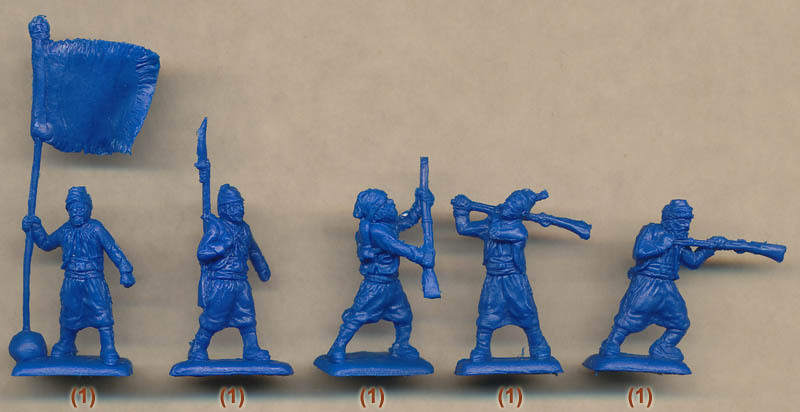 A few seem to have the rolled tent section round their pack - a feature of the regular infantry, but the zouaves had their cape rolled on top of the pack instead. Also none have any kind of scabbard for their bayonet, nor any haversack, canteen or other items of kit that might be expected. However as we have come to expect from Strelets there are some nice little touches. One man has his foot coming through his boot, reminding us that the French supply situation suffered considerably during the latter part of the war. The sculpting is on a par with other recent output from Strelets. These are not elegant figures, but they have good detail and there is little flash. Some of those firing are not looking down their weapon, and many of the poses are quite awkward and poorly done. In particular some of the advancing and close-quarter combat figures are not good, such as the man stepping over a small barrel. This is a pretty active set of figures less well suited to placing in large rigid bodies of men, something like the originals. The French retained this uniform largely unaltered until the start of World War I, and as we have said many others copied it, so these figures can be used for a wide variety of roles over many years, particularly if you ignore the advances in the rifles they carried during those years. This is a multi-use set which successfully captures something of the spirit of these exotic soldiers. 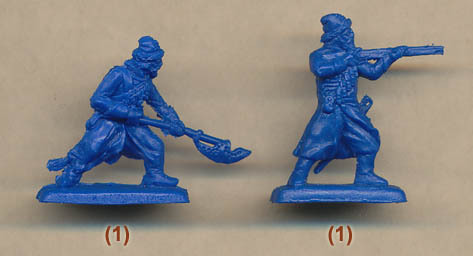 Note The final two figures are of soldiers from the Streltsi of 17th century Russia. Though they are unrelated to the subject of this set, they form part of a series of 'bonus' figures which when combined will create a set of this unit for the Great Northern War. See Streltsi Bonus Figures feature for details.